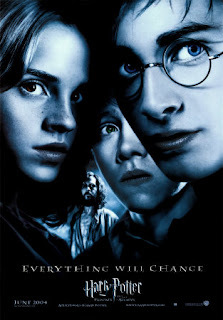 Harry Potter Retrospective Part III - "The Prisoner of Azkaban"
"Azkaban" marks the first time that I actually sought out a "Potter" film on my own without the influence of a family gathering. I spent that summer in Searcy, Arkansas which is amazingly even more of a boring place than it sounds. There were two theaters in Searcy. The first was a classic, one-screen, "Majestic"-like theater that sat right off of Main and unfortunately smelled as if it hadn't been cleaned since 1950. The other was an almost equally run down eight screen theater with rickety seats, bad projectors, and an owner that everyone called Slick who was a known drug dealer. But, Slick was smart enough to realize that there's NOTHING TO DO on a weeknight in Searcy, Arkansas so he started "Two Dollar Tuesdays" which is exactly what it sounds like: two bucks got you into any movie in his theater. And so it came to pass that my "Potter" fascination was born in this pot-funded cesspool of a theater. "Azkaban" is a departure from the rest of the "Potter" films and books because its villain isn't He Who Must Not Be Named. "Stone" and "Chamber" feature watered-down versions of Voldemort and books four through seven display the great villain at full power but "Azkaban" barely touches on his presence. In some ways, this seems an odd choice for Rowling but I've always felt that it was a stroke of genius for several reasons. First, it provides a break in the narrative that keeps it from becoming repetitive. This was especially significant in the films. Second, "Azkaban" allows for the other characters and plot lines to really develop. We are introduced to a number of new and exciting characters and we get a much deeper look at Harry's family. This is important because throughout the entire series to this point, both on screen and in print, the audience learns as Harry learns and discovering what his family was before their deaths further deepens the connection between reader/viewer and character. Third and most importantly, "Azkaban" provides a near perfect base for transitioning the audience over to the new, darker world that Harry and his friends find themselves in. In my opinion, if Rowling, coming off the child-like nature of "Stone" and "Chamber", had delved directly into the grave subject matter of "Goblet of Fire" without taking a break from Voldemort in "Azkaban", she would have experienced some critical backlash. "Azkaban" allowed this series to preview the deep stuff that lay in the road ahead without jumping in head first. I don't think any of the other films inspire such a great divide in terms of fan reception. You can find people who will argue this is the best of the series and you can find others who are infuriated by the mere mention of the film's name. The detractors almost exclusively point to the fact that the screenplay excludes numerous details from the book, particularly concerning the relationship between James Potter, Sirius Black, and Remus Lupin which is definitely true. Personally, however, I think the narrative of the film is almost perfect. You can't put 500+ pages into a movie; cuts have to be made. What David Heyman and new director Alfonso Cuaron did was create a film that works both as a companion piece to the books and a one-off for those who weren't reading the series. If you had read all of Rowling's works, you could fill in the blanks the film left for you to find with your knowledge gained from the page. On the flip side, if like me, you hadn't gotten sucked into the literature as of yet, you could enjoy the film without ever knowing that you're missing out on any information. That balance set a spectacular tone for future film installments because, as the books get longer and longer, more and more has to be left out of the screenplay and you have to choose a story that makes sense to both parts of the audience. 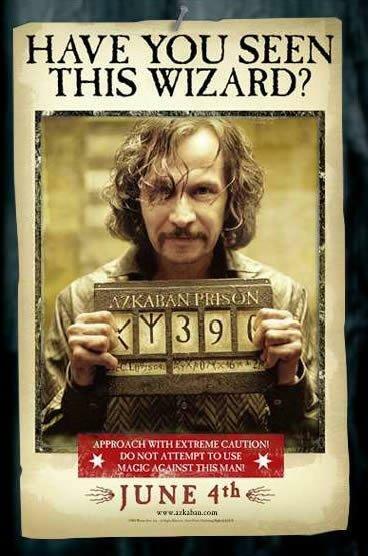 I think "Azkaban" did that wonderfully. From a purely film standpoint, "Azkaban" is a work of art. Other than Guillermo Del Toro, I don't think Heyman could have selected a better director to display the dark and dangerous world that this third film opened up. It is shot spectacularly, often with dark settings and even darker color contrasts, an edge that illustrates the maturing themes perfectly. When Harry and his friends arrive at Hogwarts, a group of students is singing "Something Wicked This Way Comes", a delightfully twisted little background note that caught my attention right off. Everything Cuaron did in this film was designed to make it clear that this was no longer a series for children. And just like the maturity of the film, the cast grew significantly in "Azkaban" compared to where they were in "Chamber." Radcliffe became an actor in this film whereas he had just been a character before. Grint turned into a bona fide comedian which screenwriter Steve Kloves recognized and utilized, feeding all funny lines to Ron. Watson, meanwhile, improved tremendously on her skill set and was no longer the weak link. Possibly even more impressively, Heyman again went out and got the best British actors that money could buy to fill up the empty spaces in the adult cast. With Richard Harris having passed away, Michael Gambon was brought in to fill the role of Dumbledore and while that transition was a bit rocky, I've always felt that while Harris was the superior actor, Gambon brought much more life to the character, which was needed. David Thewlis, who to this point almost always played wholly unlikeable characters, completely embodied the spirit of Remus Lupin and made him even more lovable than he'd been in the book. I openly rooted for that character in "Azkaban." And then there's Gary Oldman, the best actor of his generation, and a great chameleon who so wrapped himself into the character of Sirius Black that you almost can't tell where Oldman ends and Black begins. Black is my favorite character from both the books and the films and I'll be quite honest when I say that without Oldman's portrayal, I'm not sure where the character would rank. In a cast filled with incredible actors, Oldman shined brightest and took this series to a higher level. Absolutely brilliant. You can disagree with me as to where this film ranks with the other "Potter" films but there is no denying that "Azkaban" is the most important one in the series. Regardless of its departures from the book, "Azkaban" is the film that opened this series up to a whole new audience. It became acceptable among teenagers, college kids, and full grown adults alike to admit their interest in the franchise and made people, including me, recognize the maturity of the subject matter. I still didn't read the books but "Azkaban" made me truly appreciate the fantastic nature of these stories and left me legitimately wanting more for the first time.